I am by nature a rather introverted and shy person. Given a small gathering, I can be quite talkative, but in general in larger social circumstances, I tend to be more of an observer. There are of course some occasions where observing is not an option and active participation is required. Sometimes public speaking might even be required. Contrary to what might be expected, I am actually perfectly fine with this. A long time ago I developed the idea of a “social helmet.” This is very much like the saying “put on your thinking cap.” Basically, when going into social engagement, I (metaphorically speaking) put on my social helmet and communicate like a normal, outgoing person. The funny part about this is that I have always had a very distinct mental image of what my social helmet would look like. First of all, notice that it’s a helmet and not a cap. Apparently social engagements require something more robust than the standard cap. 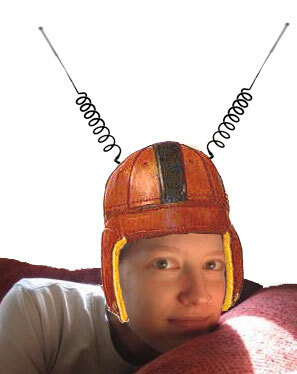 My social helmet is essentially an old-school leather football helmet with antennas. What does your social helmet look like?